The Allerton was later known as the Manger. There was a fabulous top floor bar where the town’s newspaper crowd hung out. Few alive today would remember that, but if you run across newspaper people over 70 or so you mightbet some good reminisces. Cleveland has always been a city of great contrasts – across from the Allerton/Manger at the SE corner of Chester and E 13th St was one of the original White Castle restaurants. That business was started by a Cleveland family. Its HQ was at the NW corner of Lee and Cedar. Ultimately, they made more money selling the restaurant business (to SugarDale I believe) and keeping the real estate corners for later sale. The restaurant I recall if memory serves me was a Royal Castle at the NW corner of Cedar & Lee in the early 50s. My grandparents lived the next block over on Derbyshire. Re the Manger, the lounge was called the Purple Tree. I believe the Purple Tree was the standard lounge in other Manger properties. As memory serves me (again), the Allerton didn’t have private baths in every room. But when Manger had it, all rooms had private baths, reducing the number of hotel rooms. Think it was about 450. Interesting information, but I can’t confirm it by other sources. My mother-in-law was in the Navy during WWII and was assigned in Cleveland. 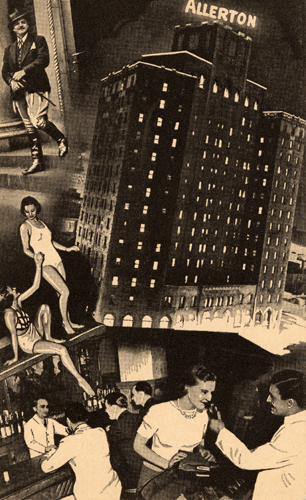 While there she lived for a period of time with others in The Allerton Hotel. She worked in offices somewhere near for her entire period of service. Can anyone give any details about the arrangement? Were many rooms block rented to the Navy for the war effort or was the whole Hotel taken by the Department of War? 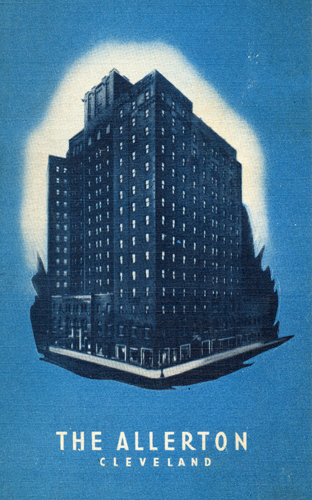 I am writing my next book on Cleveland Hotels and it is true. 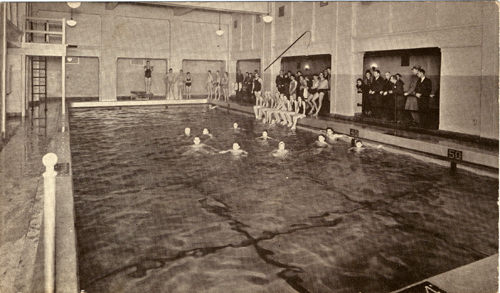 The Allerton Hotel was taken over by the Navy so it could house their WAVES in the building. I have more details if you would like them. Picked up an interesting piece of Allerton paper ephemera today, an admission “ticket” to the Saturday Night Swing Club Floor Show on March 9th, 1940 9PM-1AM. Price was 50 cents, ticket good for 10 cents. Today, while cleaning out a drawer, I found soap in their original wrappers from the Allerton Hotel. July 22, 1949 is the day after my parents wedding. The Allerton is where they had their honeymoon.